Rote Island is a part of Kupang Regency and is the southernmost island of Indonesia. It is located in the west coast of Kupang. This exotic island can be reached only in four hours. 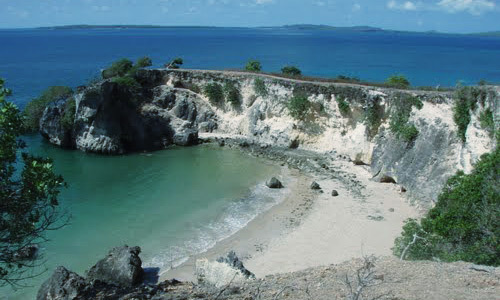 From Kupang by inter-island ferry to dive and tour this untouched beautifully rugged land. Spectacular walls and caverns mirror the hills, valleys, and escarpments underwater. The marine life is so varied and profuse that is hard to believe from Fire-fish to Mantas. The architecture of Rote is unique, as is their exquisite ikat weaving. See the people is their traditional lifestyle, which has remained unchanged for centuries. Rote has many historical relies including fine antique Chinese porcelains, as well as ancient arts and traditions. Many prominent Indonesia nationalist leaders were born here. A popular music instrument Sasando, which is made of palm leaves. According to legend, this island got its name accidentally when a lost Portuguese sailor arrived and asked a farmer where he was. The surprised farmer, who could not speaking Portuguese, introduced himself, "Rote". Rote just off the southern tip of Timor Island consists of rolling hills, terraced plantations, and acacia palm, savanna and some forests. The rotinese depend, like the Savunese, on lontar palm for basic survival, but also as the supplement their income with fishing and jewelry making. Before Indonesia's Independence, Rote, boasted the highest density of kingdom in the East Indies. Even today the island, the Rotenese and their kingdoms are divided, following ancient tradition, into two domains, one known as Sunrise and one as Sunset. A “male” Lord, a “female” Lord and several advisers, representing the clans within that domain, rules the domain. Each clan that possesses ceremonial rights performs it's own rituals during the annual HUS celebration, a traditional New Year festival. At the HUS, Rotenese men wearing their unique hats make offerings to the clan ancestors and the women dance accompanied by sasando, The Rotenese guitar. Rote is particularly well know for its surfing, each year surfers flock to Namberala to ride the near perfect tubes formed by the shallow reefs and off-shore winds. Accommodation in Namberala includes a traditional beachfront bungalow resort and several home stays. The beach itself is one of the best examples of a palm fringed pure white sandy beach to be found anywhere. Diving in the area is also exceptional due to the large numbers of Manta and Dugong seen there. A boat trip to nearby Dana or Ndao Islands is also recommended.